The façade of the Capital Gate in Abu Dhabi was constructed by Waagner-Biro Stahlbau AG with Advance Steel, the 3D-Software for steel constructions. 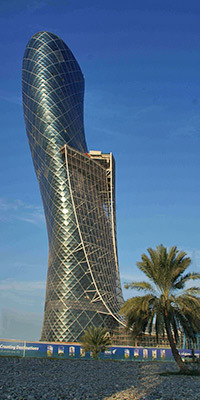 The spectacular skyscraper “Capital Gate” was created directly to the Abu Dhabi National Exhibition Center, the biggest area for trade shows and events in the Middle-East. The Capital Gate is 160m high and has an impressive inclination up to 18 degrees. Therefore it is more inclined than the leaning tower of Pisa that has only an inclination of 4 degrees. In the Guinness Book of Records the Capital Gate is already listed as the most leaning tower of the world. The building was erected between 2007 and 2010. It consists of 40 levels and is used as an office complex. In the 16th upper floors a five-star-Hyatt Hotel is located. Waagner-Biro AG from Vienna was responsible for the modeling, construction, detailing and assembly of this extraordinary and organic formed steel-glass-facade of the Capital Gate. The tower has a polygonal foundation and the facade is one degree per level sloped and twisted. At the most inclined part the facade leans out more than 24m over the ground floor. The main-load bearing structure consists of a diamond structure. More than 720 diamond elements were field-assembled by triangle sections with the glass and finally mount complete to the main structure. Each of those large-sized elements called “Diamonds” covers two levels and consists of 18 triangular areas and 33 single rods. For the entire facade 23.760 single bars and 12.960 glass panels were used. Because of the complex free formed surface each triangular glass panels and each single bar is unique. All in all more than 1.200 tons of steel and 24.000m2 glass was used for this extraordinary facade. In order to realize the complex and challenging project in cost and on schedule, the 3D-CAD Software Advance Steel was used for planning. Thanks to its extensive 3D-tools it was easy to model the sculptured surface with nodes, rods and joints between them. Advance Steel processes the entire 3D model data, accelerates all document creation and insures all-around drawing consistency. An in-house programming on top of Advance Steel created all workshop documents (assembly drawings, GA-drawings, BOMs, NC-files) automatically from the 3D model. Mr. Gert Weimann, head of engineering and construction department at Waagner-Biro AG, explains: “The project Capital Gate was a big challenge for us especially concerning the geometry, construction, detailing and assembly. Advance Steel increased the productivity in engineering and in the participated departments by more than 50% due to its 3D abilities and its possibilities of a comprehensive programming“. Waagner-Biro is an international company for steel constructions and has its headquarters in Vienne, Austria. The company was founded in 1854. More than 1.000 employees work for Waagner-Biro in 16 offices in Europe, in South-East Asia and in the Arabic countries. Waagner-Biro is specialized in steel-glass-technology, bridge constructions, stage constructions and special mechanic engineering. Some of their main references are the cupola of the Reichstag in Berlin, the YAS-Marina Project in Abu Dhabi, the new airport terminal in Baku (Azerbaijan) and the Sony-Center in Berlin. SAS BOULET BATIMENT is a 50-employee company located in the city of Azincourt (north of France) and which is specialized in steel construction. Maxime Delforge, in charge of the 3D modeling at SAS BOULET, explains why Advance Steel – after only few months of use – handled projects of any type and allowed for sub-contracting more efficiently the fabrication of these steel structures thanks to the high-quality drawings and NC-DSTV created automatically. After a demonstration which proved that the software answered positively to all company’s requests, SAS BOULET BATIMENT acquired Advance Steel in the spring of 2012. More than 6 months later, we can say that several dozens of projects have been modeled in 3D and successfully erected at site. It includes structures of all types going from renovations (like an outside roof in a school made of curved rafters connected on the top of concrete columns already in place) to the conception of industrial buildings (such as food plants) or commercial buildings (different supermarkets and warehouse supporting cold rolled Zed purlins). In addition to the possibility to model all the main steel structure (portal frames, floors, side rails), Advance Steel provides different functionalities to represent the environment (existing concrete walls, machinery, piping,etc.) and therefore to handle a global multi-material project which can also sometimes contain timber elements such as the purlins. This is very important as this is taken into consideration by the integrated clash check which prevents issues at site. It is also possible to create in 3D the gutters or other types of complex folded elements (e.g. stringer made of a folded plate for stairs) and to get their workshop drawings with the part displayed both folded and unfolded, which is highly appreciated by the workshop as it facilitates their understanding. SAS BOULET BATIMENTdoes not have an integrated workshop and therefore the fabrication is sub-contracted; this is also where Advance Steel finds its right place as it automatically creates all NC-DSTV files which can then be read by the CNC machines of the workshop. Discover how you can easily create a gutter formed from a folded plate with Advance Steel! This movie shows how you can easily create rectangular & polygonal plates for the all the different sides of a gutter and then use an automatic tool to get a gutter formed from a folded plate. As a result, this gutter can be automatically displayed unfolded in the modeling as a preview but also within NC files and workshop drawings for fabrication. Fantastic feedback from one of our UK clients! Westbury Park Engineering are a service Engineering Company specialising in Fabrication, Structural and Mechanical Assemblies together with custom built equipment. Their experience and diversity from being involved in the industry for more than 20 years has culminated in a wide knowledge and understanding of working practices, technologies and industry requirements. Westbury Park Engineering have the experience to complete contracts from complete materials handling plants, MOD and Petrochemical Fabrications with full manufacturing traceability to mechanical and custom built assemblies including Hydraulics, Pneumatic, Electrical and CNC systems. 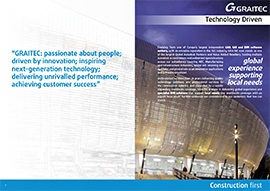 Westbury Park Engineering has been working with GRAITEC software for a number of years now. Nial Ball, Westbury Park Engineering, recently sent in his comments following a site visit by one of the Technical Support team at GRAITEC UK: “I would like to thank John Bennett for the hard work he did yesterday in re-installing my Advance Steel. I think the work involved was a little more than he had anticipated but my Advance Steel seems to be working so much better now. Thanks again for your commitment to customer service and satisfaction. I can’t imagine that many other companies would be so dedicated to their customers“. GRAITEC UK are committed to providing customers with the most efficient Technical Support service possible – a first class service our customers have come to expect over the years. We remain focused on delivering outstanding service, and we are delighted to receive these extremely positive comments. GRAITEC UK offers its users a wide range of services which can help optimise productivity: complete service maintenance, phone and E-mail based technical support, interactive live web support, general and custom training, CAD/design projects, custom software development and many others. You can visit our Support page for more information, or take a look at GRAITEC Advantage to see all the services included in our maintenance contract. Established in 1903, Peddinghaus Corporation is the acknowledged global leader providing innovative machine tool technology for structural steel and plate fabrication. From Anvils and Bench Vises to Technologically Advanced Structural and Plate Fabrication Systems, Peddinghaus has served the Steel Construction, Heavy Plate Fabrication, and related Metal Working Industries for more than 100 years. 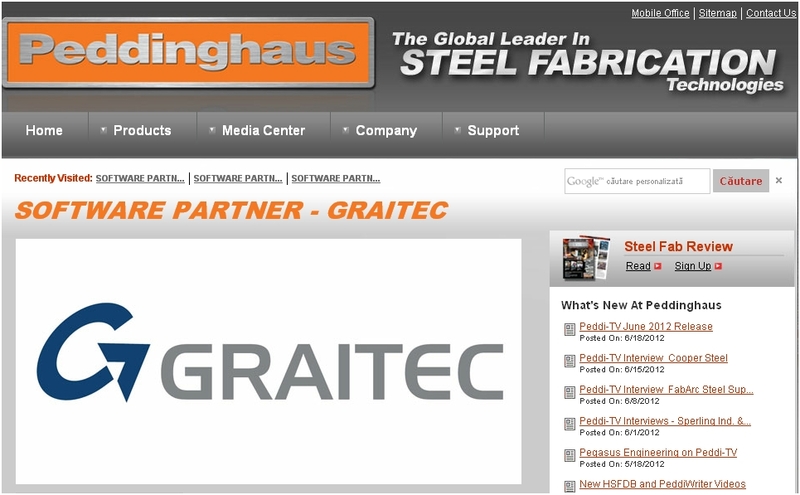 Being committed to the industry for such a long time, Peddinghaus turned to GRAITEC’s ADVANCE Steel, because of its ability to automatically generate bills of materials and NC files. 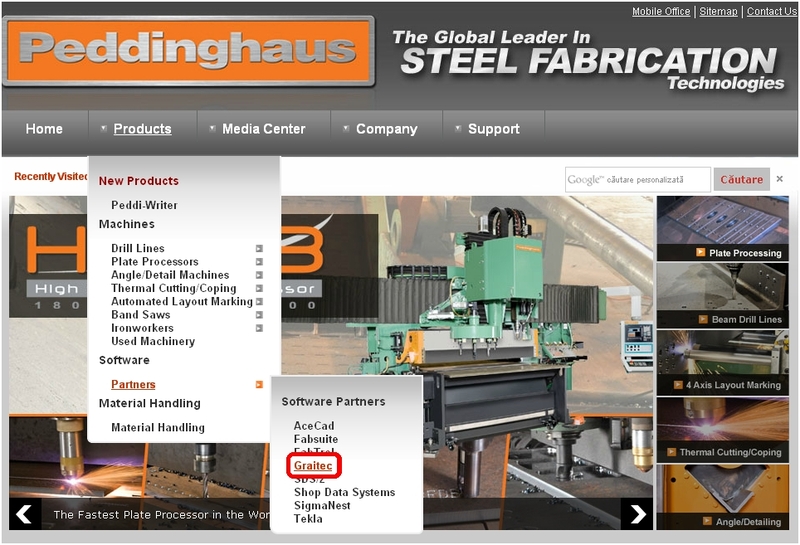 With ADVANCE Steel, there is a direct link from the model to the Peddinghaus machine tool. Basically, CNC machines can be programmed by advanced design software, enabling the manufacture of products that cannot be made by manual machines, even those used by skilled designers or engineers. Modern design software allows designers to simulate the manufacture of their ideas. There is no need to make a prototype or a model. This saves both time and money, while providing the most accurate, productive, and profitable parts or products. 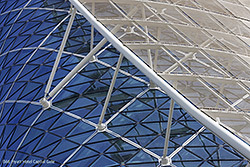 ADVANCE Steel creates all fabrication drawings and offers a large selection of tools for automatic detail creation, dimensions, annotations, and accelerates the creation of general arrangement drawings, fabrication drawings, list of materials and NC files: complete library of structural elements, parametric and customizable connections, wizards for miscellaneous steel (stairs, railing), materials library, sections, bolts, and others. Needless to say, the advantages of combining computer aided manufacturing (CAM) and computer aided designing (CAD) are many: reduced cycle time and non-production time, jobs can be set up more quickly, improved accuracy, reduction of scrap and lower scrap rates. Advance Steel is a complete 3D BIM steel detailing software providing automatic and user-friendly tools for creating the 3D model of your building in the best time. From the creation of the portal frames to the generation of all cladding profiles, Advance Steel comes with numerous easy-to-use tools for purlins, side rails, automatic connections, stairs, railings and much more! See how user-friendly and powerful Advance Steel 2012 is to navigate through a complex pedestrian bridge (model courtesy of PKD, Czech Republic). March 22nd, 2012. GRAITEC is pleased to announce that the GRAITEC North American team will be exhibiting at NASCC, the steel conference in Dallas, Texas, on April 18-20, 2012 at booth #610. The GRAITEC team will be demonstrating Advance Steel 2012, the powerful and user-friendly 3D structural steel detailing and fabrication software that automatically creates drawings, BOMs and NC files, and that communicates with Autodesk® Revit® among other systems. Version 2012 of Advance Steel provides the user with the choice of CAD platform, AutoCAD or the GRAITEC CAD platform. The team will be demonstrating Advance Steel with both platforms at the NASCC. GRAITEC will also be demonstrating Advance Design 2012, a superior solution for the structural analysis and design of Reinforced Concrete, Steel and Timber structures according to the latest versions of Eurocodes and North American codes.